This is a trip long delayed. 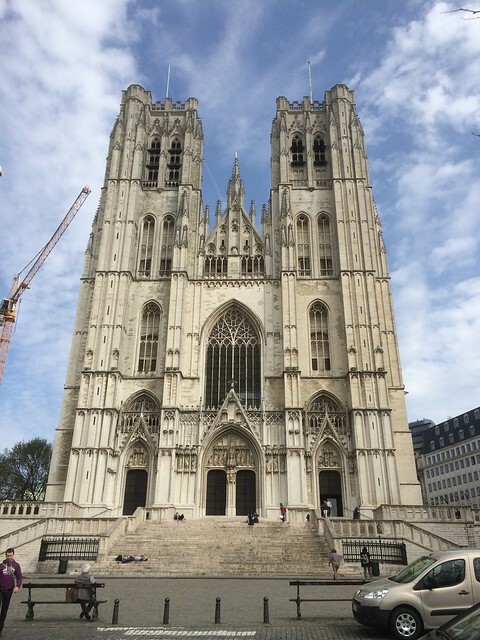 My previous plan to go to Brussels fell through years ago, and it’s not until now, in entirely different circumstances and for very different reasons, that I’ve finally gotten around to visiting the beating (or at least stuttering) heart of modern Europe. As is more or less standard procedure, I’ve made things as tricky for myself as modern travel convenience will allow. In search of the cheapest flights, I was up at an ungodly hour this morning, blowing some of what I’d saved on the airfare on a taxi to the airport. Luckily, there were two advantages of being a pre-dawn traveller: few others are foolish enough to be up and about at such an hour, so there’s precious little waiting around to be done, and I’ve enough practice at getting up early that I didn’t feel the need to close my eyes and snooze until I was safely in my seat on the plane (where I had an entire row of seats to myself). The Brussels-dwelling friend who I was visiting had provided copious directions on how to make out of the airport and into town for our lunchtime interview, but I’ll admit I no more than skimmed them. I’ve developed a taste for seat-of-the-pants planning when on holiday—one of the indulgences available to the solo traveller—and beyond knowing where I was heading and which bus to take, not much else was necessary. At first sight, Brussels was difficult to figure out. The airport is close enough to the city that there’s little transition time from one to the other, and if there’s a point of familiarity to be seen with my home town of Dublin, it’s the general lack of towering buildings. Dublin, though, is a pretty focused town, revolving around its centre by the River Liffey. Brussels seems much more diffuse, the twin centres of the existing city and the relatively new European Parliament resulting in odd juxtapositions of tiny streets and shiny office blocks. The result is not the easiest of places of navigate through, as there are few visible signs that you’re heading in the right direction until you turn the corner and see your goal. Even so, I made my way comfortably enough from the Place Luxembourg to the Place Jourdan, with only a momentary distraction courtesy of the Dinosaur Museum (and if there are two words whose combination is more likely to distract me than “Dinosaur” and “Museum,” I’ve yet to uncover them). Alas, there was no time for museum crawling. At that moment. 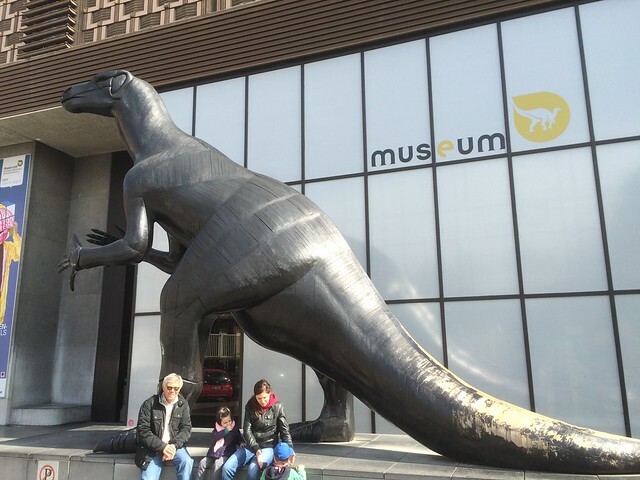 Several days in Brussels awaited, and dinosaurs and museums were likely to crop up again at some stage. First though, I had a lunch date to keep and accommodation and luggage to sort out. Courtesy of the legal local, all of this was dealt with in appropriately speedy fashion. We grabbed some lunch in one of his preferred haunts not far from the Pace Jourdan, then he took me on a walk up around to the Parc du Cinquantenaire before circling round again, helping me get oriented. After that, he relieved me of my luggage and let me loose to fend for myself. Which meant, as usual for myself, walking. Lots of walking. First of all following the Rue de Trône up to the excessively wide Boulevard de Waterloo, then across that and into the older part of the city, the one not dominated by European institutions. There was plenty to see here, including some wonderfully weird architecture (the Museum of Musical Instruments was a particular highlight and well located), but as with the Dinosaur Museum, I was happy enough to just wander around and get a feel for things. I pinballed my way around Brussels’ historic centre for the next few hours, following narrow side streets packed with al fresco diners, squares lined with a grab bag of architectural styles, the famous (and easily missed) Mannequin Pis, and more tourist traps than you could shake a very large stick at. Eventually I made my way to the Bourse, where I was to meet another friend, albeit several hours early for that encounter. So I struck out in several directions: first northwest to the canal, then northeast along a shopping strip (the most jam-packed part of Brussels to date), then up the hill to the Cathedrale des Sants Michel et Gudule (which has a nice underground section showing the foundations of the old Romanesque church beneath it), and finally southeast to some comics stores, where I was able to practice my French reading comprehension a bit more and remind myself that when it comes to sophistication and variation, the French and Belgian Bandes Dessines have been ahead of their American and British counterparts for quite a long time. Eventually I’d wasted enough time and returned to the Bourse to meet my second friend of the day, this one a native. This was only the second time I’d visited her in Belgium, compared to several visits to Ireland on her part, and she wasn’t missing the opportunity: we hit numerous bars and one restaurant, and I racked up four good Belgian beers in quick, but not too quick, succession (Duvel, Orval, Leffe Blond and Duchesse de Bourgogne). Sadly, all good things must come to an end, and I had to make it back across town before the buses ceased to run, and certainly before my long-suffering phone ran out of charge. So a bus stop was found, farewells were said, and I was on my way south to Place Eugene Flagey. There the Legal Local located me and guided me back to his garret, tucked under the roof of one of Brussels’ older buildings, where a inflatable mattress had already been set aside. Some struggling with a poor wifi signal was the most activity that either of us could muster, and soon it was time for sleep instead.